You think YOU have an unusual special request? We can provide amplification services! iPads - How did we ever do this without them? Trio might be perfect for your event! Plays Well With Others specializes in performing arrangements for string ensembles of popular music spanning all genres. You'll find Classic Rock, Indie, Country and Top 40 titles right along with an expansive collection of traditional classical music in our library. If you don't see the song you want, just let us know and we will compose an arrangement of that music for your event. It's that simple. And simply beautiful. I have to say everyone at my wedding was beyond impressed with the quartet! From the wide range of music of their set list to their professionalism and quality of sound was simply amazing. I have to say I definitely got more bang for my buck than expected, even the resort was asking where I hired them and who they were. They added a level to my wedding that was way beyond expected. I would highly..HIGHLY recommend hiring them. I wish I would have just booked them for the whole wedding rather than a dj for the reception. Thank you again teresa and the rest of Plays Well With Others for being a part of my wedding. I hired a String Trio of Plays Well with Others to perform during breakfast at a restaurant to start the celebrations of my 50th birthday. I must say, that Teresa was wonderful to work with. She is upfront, prompt and right on with what they can play (which is an enormous list). Not only did many (unknown to me) others at the restaurant enjoy the set, they made a point to mention it to me (and of course thank me for the music LOL). Would and will I recommend Plays Well with Others to add that extra special ingredient to an event or for any formal event? Absolutely! Definitely! Reliable, talented, dressed nicely, good communication, everything as planned. Very happy! We all REALLY loved the venue and you! Also, your sound guy is the bomb.. Thank you so much for your kind review. Looking forward to working with you again soon. An excellent, calm, fun and happy planner; who knew? Theresa was talented and engaging and my guests loved her! 5 stars, from beginning to end. Look no further for the perfect cellist! Teresa was fabulous and the PERFECT choice for our Beach Wedding at the Hotel del Coronado. Teresa also played a wide variety of music throughout the evening, at our cocktail reception, and then later at dinner. 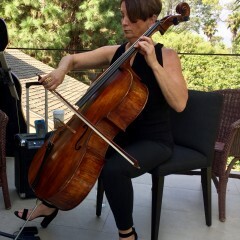 I think just about every guest at one point in the day, came to me to comment on how talented Teresa is, and how choosing a solo cellist was the perfect elegant choice for our intimate wedding. I will definitely have her perform at our next event, without a doubt. Blushing and beaming, thank you! I look forward to our next adventure! Lovely people and great musicians! I booked Plays Well With Others for my party and I could not be happier with the outcome. Teresa is so easy to communicate with and she even agreed to arrange a song for me. All 3 musicians were lovely and truly seemed happy to be performing for the guests. I got many positive remarks about them throughout the night! Plays Well With Others recently played at my wedding at the Surf and Sand Resort. The trio leader, Teresa, was so wonderful throughout the planning process. Always responsive to my questions and took the time to explain in detail the whole process of how the trio would be involved on my big day, from their attire and set up through the ceremony cues and music, and the music for the cocktail hour. She was so kind, supportive and patient and made me feel completely confident in her and at ease leading up to the wedding. They are also very versatile and were able to beautifully accommodate unique music selections and a wide variety of genres. They played a huge part in making my wedding day so perfect! I truly could not be happier and would recommend them for any event!! It was an honor to be a part of your perfect day. You were positively gorgeous and glowing, your guests were so sweet and your words are so kind. We enjoyed every minute. May you have a wonderful honeymoon and may your years together be full and rich. I was planning a very-informal, family-only celebration of life for my mom, who had passed away only two days prior. 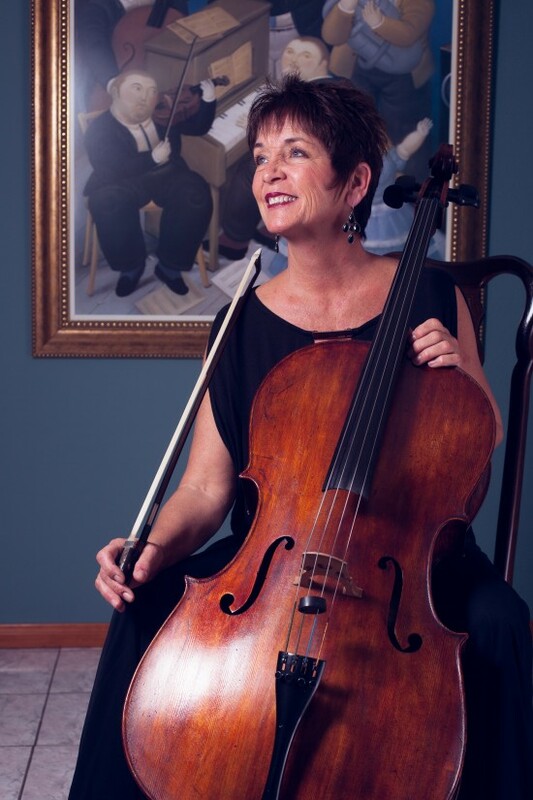 At the last minute my sister suggested that we hire a cellist, as my mom had played the cello in her youth. I had little hopes of pulling this off in such little time. But I ended up receiving a bid from Plays Well With Others, which was quite reasonable. Despite the fact that she had another commitment later on the day, she was moved by my narrative and agreed to play for us. And she was phenomenal. She was the perfect musician and individual for the situation and for our family, and ended up staying twice as long as her commitment. Everyone loved the music, and I could not have been more pleased with the outcome. My husband and I could not have been happier with Teresa and the rest of the string quartet. They are excellent musicians and, just as importantly, easy to work with. Our ceremony could not have gone as well as it did without them providing the soundtrack. My wife and I believe we had a dream wedding. Everything went as planned. One of many things that made our day memorable was the quartet (Plays Well With Others). They were easy to work with and very flexible to our music selection and schedule. Our wedding guests have commented that they enjoyed the talent and professionalism of the quartet. Thanks. Your wedding was a dream to play! Thank you for making us a part of your day. I can't say enough wonderful comments about "working well with others music"? This is in reference to the gig at Escena Country Club on Saturday March 7th, in Palm Springs, CA. They played the wedding of Ed and Marvin. The quartet was diverse in their selections, appropriate, well versed, professional, in a sum, a wonderful enhancement to our occasion. What a wonderful day it was! So honored to be part of it! 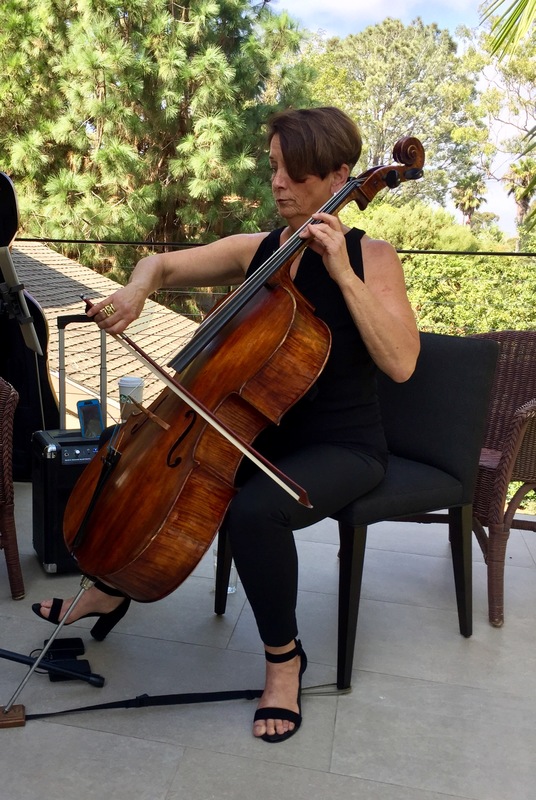 I'm Teresa Di Pietro, and I created Plays Well With Others using over 20 years of experience playing as a professional cellist in Southern California. Although I am classically trained, I love all genres of music and that is why I go to great lengths to offer clients the music they love. I am constantly adding my own and other colleagues' arrangements of new music to our library and with the popularity of groups such as the Vitamin String Quartet, popular music played by string ensembles is growing by leaps and bounds. This music is demanding for the typical string player, so I don't hire typical players! I use only those professionals who are able and open minded enough to play "outside the box". Plays Well With Others is also one of the few groups of artists whose performances are played exclusively using iPads. No sheet music or stands! This adds a streamlined, elegant look to our performances while giving us the convenience of being able to have all of our repertoire at our fingertips. This technology also provides individual lighting so that we can perform at almost any location and always proves fascinating to our audiences. The musicians booked for your event are highly trained, sought-after professionals working regularly in Southern California. We perform regularly with numerous symphonies, chamber orchestras, vocal ensembles, pit orchestras and you have likely seen us on televised musical programs. We have played at hundreds of venues in Southern California including the Walt Disney Concert Hall, the L.A. County Natural History and Palm Springs Art Museums, the Convention Centers of Los Angeles, Anaheim, San Diego, Pasadena and Palm Springs, numerous country clubs, resorts, churches and private homes. I hope you will consider Plays Well With Others for your special event. I think you will like us. After all, we do, Play Well With Others! 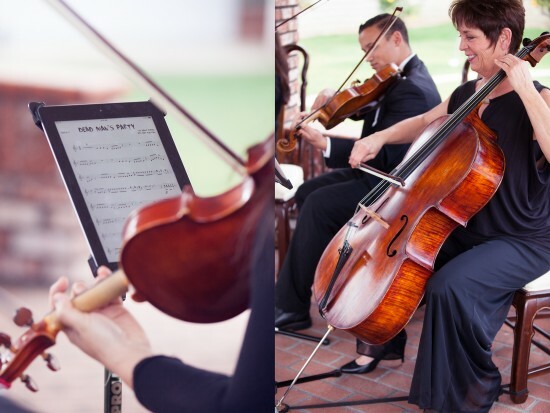 Plays Well With Others exclusively uses iPads, not sheet music and stands for all performances. This keeps our library at our fingertips, page turning a thing of the past and lighting and music clips obsolete. You will love the look and we love being able to tell your guests that yes, we do take requests! Gabriel's Oboe (from "The Mission"
Grande Valse Brillante from Waltz in Eb Major, Op. Op. 8 #1 - "Spring"
The musicians I work with are all fortunate to have had intensive chamber music training. We aspired to groups like the Guarneri String Quartet when we were students and were coached by some of the very best teachers. We apply this now to all genres of music. One reason we are so versed in popular music would be the rapid increase in popularity of the Vitamin String Quartet. We enjoy that we can be so chameleon about styles of music and do justice to all of them.